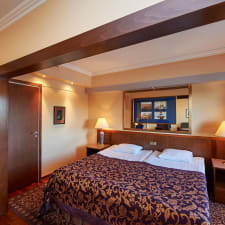 A legendary hotel that caters to your every need in the best location in Rovaniemi. Enjoy a good night’s sleep, the delicacies of our traditional restaurant and friendly service. In the beautiful scenery of the Kemijoki river. The hotel is a cosy place to rest in the amazing Arctic landscape. Our comfortable rooms and extensive room selection cater for all needs. Some rooms have views over the Kemijoki river, some have their own balcony. In addition, you can choose a room with a sauna or a room with a jacuzzi. In the traditional restaurant Pohjahovi, enjoy flavours from Lapland and admire the beautiful scenery of the Kemijoki river. The lobby bar serves fresh drinks and small snacks. The hotel also has a popular karaoke bar, dance restaurant and nightclub as well as a spacious relaxation suite with sauna and swimming pool. Pohjanhovi’s conference and event premises are flexible. Here you can have both traditional conferences as well as events and parties. All areas of our hotel have free WiFi. The hotel is located in the best spot in the city, on the banks of the Kemijoki river. All city centre services and the pedestrian street are located nearby. In winter, the snowmobile safari routes start from the corner of the hotel, and the Ounasvaara ski resort and beautiful nature routes are located nearby. It’s easy to explore the sights in the surrounding areas, such as Arktikum, Santa Claus Village and Santa Park.